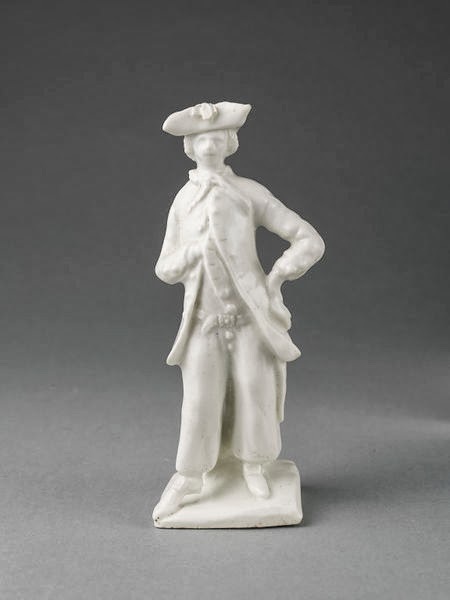 Figure, Bow Porcelain Factory, c. 1755, Victoria and Albert Museum. This unpainted porcelain figure is one of the earliest three dimensional pieces I've included on this blog. Typical of that time, the sailor is depicted with a long coat, though slightly shorter than other professions would wear. His cocked hat is reversed, but fitted with a large cockade at the front. He wears a neckcloth tied tightly around his neck and an unbuttoned waistcoat beneath his jacket. There is a belt with a large rectangular buckle at his waist. The tar's trousers are long and built with a button fly. His shoes are pointed toe.